Early in their orientation to the garden, the kids were asked to think of what ways they should behave in the garden to ensure safety and respect of the space. Among these rules is to avoid walking on the soil within the garden beds since compacting the soil could damage the fluffy environment plants prefer to grow in. Of course, the topic of earthworms came up here as well, and it was explained to the kids that earthworms are very helpful as they break up the soil. 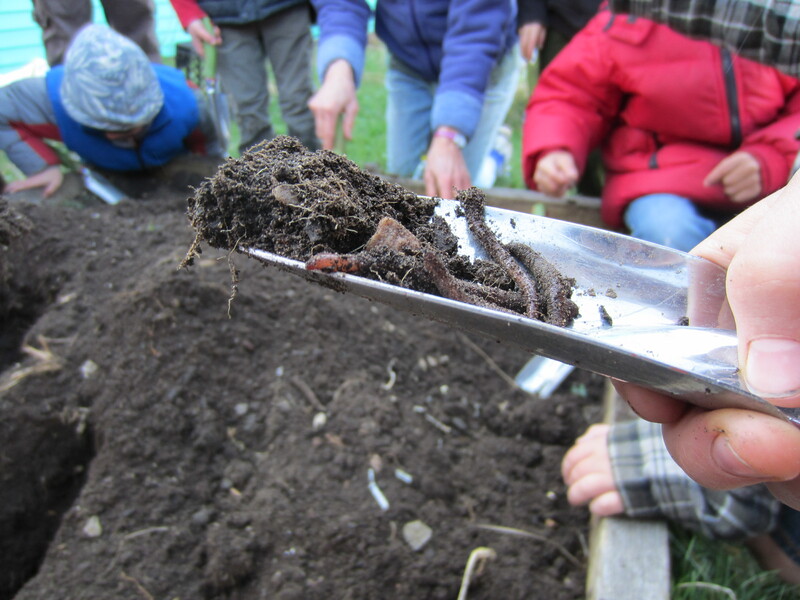 It came as no surprise to me that some of the kids would be especially fascinated by earthworms once they started loosening up the soil in their small garden bed. They eagerly picked up the worms in their hands and dug deep holes searching for more worms. What did surprise me is that I don’t think a single child was grossed out by the worms! Everyone working in the soil thought these were the neatest little critters and passed them about. 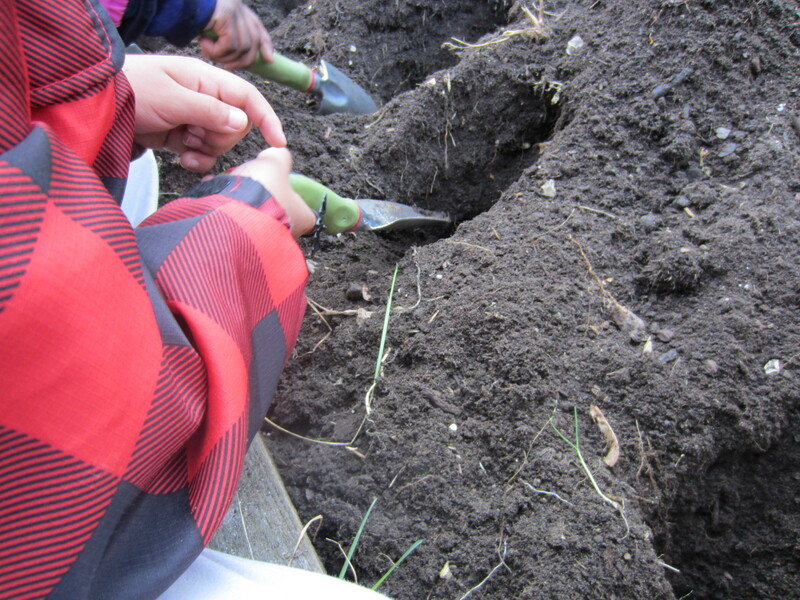 The worms even inspired teamwork – as multiple kindergarteners would search for worms and hand them to another child who had dug their new worm home! The class’s one-hour time allotted to the garden lesson flew by too quickly, and only about half of the class had a chance to place a seed in the prepared soil. Did it really matter that they missed this last leg of the lesson, though? For this young age, it seemed like the kids got to take home the overarching theme about having fun in the garden and seeing all of the life that the garden is home to. 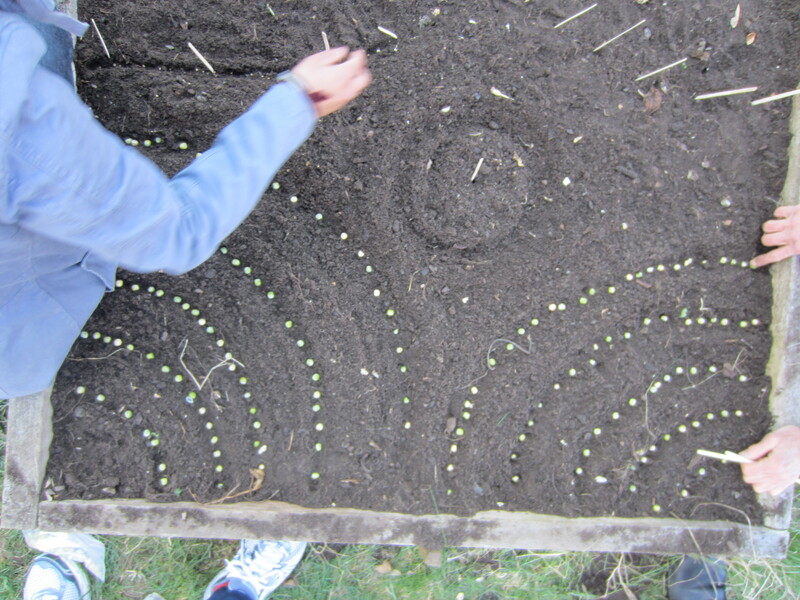 Pea planting is an art...! As the kids lined up to head back inside, one of the garden educators led a sing-along about pollinating bees. The kids left the garden holding ground cherry seed husks and herbs picked up from a spiral garden by the entryway. Perhaps a few earthworms might have been smuggled out as well! There is plenty left for this class to learn about the mechanics of growing food in the garden. For now, at least these kids have left with a fantastic first impression about the magic and science they can experience in this space. This entry was posted in Community, Garden workshops, Kids' activities, Vermont education and outreach and tagged children, community, Community Garden, Earthworm, food, garden, kids, Local food, Plant, Raised bed gardening, Snap pea, Soil, teaching garden, volunteer, workshop.